Dr. Thomas sees patients in the CCU, on the heart failure service and specializes in cardiac imaging. His research interests include clinical outcomes in heart failure, ischemic heart disease and perioperative medicine. He is board certified in Internal Medicine, Cardiovascular Disease and Advanced Heart Failure and Transplantation. 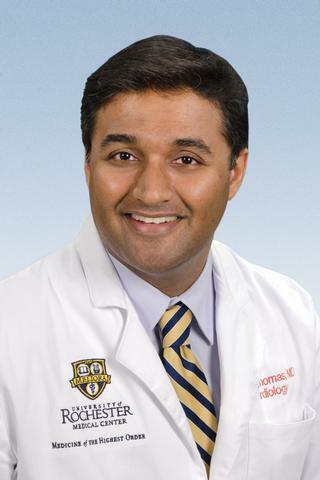 Sabu Thomas M.D. is an Assistant Professor of Medicine in the Division of Cardiology. He graduated from McMaster University in Canada with a B.Sc. (Hons) degree in Biology and Physiology and obtained his M.D. at Penn State University. He went on to complete post-graduate training at the Cleveland Clinic, Washington University and the University of Minnesota. He also completed additional clinical training in cardiac MRI at Duke University and further research training at McMaster University. He joined the faculty in 2011. Thomas S, Moss AJ, Zareba W, McNitt S, Barsheshet A, Klein H, Goldenberg I, Huang DT, Kutyifa V. "Cardiac Resynchronization in Different Age Groups: A MADIT-CRT Long-Term Follow-Up Substudy." Journal of cardiac failure.. 2016 Feb 0; 22(2):143-9. Epub 2015 Nov 05. Szepietowska B, Kutyifa V, Ruwald MH, Solomon SD, Ruwald AC, McNitt S, Polonsky B, Thomas S, Moss AJ, Zareba W. "Effect of Cardiac Resynchronization Therapy in Patients With Insulin-Treated Diabetes Mellitus." The American journal of cardiology.. 2015 Aug 1; 116(3):393-9. Epub 2015 May 09. Petkovich BW, Vega J, Thomas S. "Vagal modulation of hypertension." Current hypertension reports.. 2015 Apr 0; 17(4):532.